What is it that makes a place magical? Is it the scenery, the architecture, the friendliness of the people or their customs and traditions? Mexico is full of places that can be considered magical, once you roam off the beaten path. If you're looking for a special experience, a taste of the authentic Mexico, far away from the big resorts of Mexico's popular beach destinations, consider a visit to one of these Magical Towns. When you visit them, you will surely be enchanted, and you'll realize why they are called "Pueblos Mágicos." ​Cobblestone streets, colonial-era mansions and a 17th century mission church combine to make this lovely town a magical destination. Álamos has many buildings exhibiting classic Andalusian architecture from Mexico's colonial period, including numerous mansions, the Plaza de Armas, the Church of La Purísima Concepción, La Capilla and the Palacio Municipal (city hall). Don't miss a stop at the Museum of Sonoran Traditions (Museo Costumbrista de Sonora), which pays tribute to the state's history, culture and traditions, and when you want to head outside of town for a change of scenery, you'll find that the surrounding area includes estuaries fluttering with bird life, Mayo villages, mining towns, rivers where you can take float trips, and trails for horseback riding. For a luxurious stay in a lovingly restored hacienda, book a room at the Hacienda de los Santos boutique hotel. Read reviews and get rates for Hacienda de los Santos. Bernal is a picturesque village in the state of Queretaro, located on the slopes of the third largest rock in the world, better known as the Peña de Bernal (Bernal's Peak or Bernal's Boulder). This impressive monolith is considered one of the natural wonders of Mexico. It is the product of a volcanic implosion and is estimated to be some 10 million years old. Many of the local Otomi-Chicimeca indigenous groups consider it to be a guardian of a sacred territory, and the memory and living traditions of these people was inscribed on UNESCO's list of intangible cultural heritage in 2009. 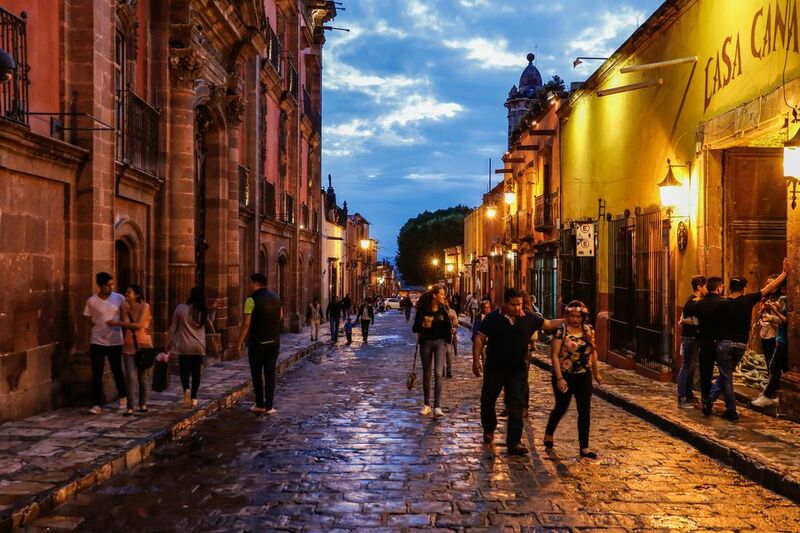 Bernal's proximity to other tourist destinations such as Tequisquiapan and Queretaro's famous Route of Wine and Cheese are an added attraction that make it an ideal place for a weekend getaway near Mexico City. This is the town where the movement for Mexican independence first saw the light of day, when the parish priest, Father Miguel Hidalgo y Costilla, rang the church bell on September 16, 1810 and called for the people to rise up against Spanish rule. The event is commemorated every year in towns across Mexico as El Grito, when the mayor of each town rings the bell in the town hall and shouts "¡Viva México!" and the people gathered in the town square respond: "¡Viva!" As you might imagine, Dolores Hidalgo is a popular town to visit especially during Mexican Independence Day celebrations, but any time of year you can enjoy its leafy plaza and interesting history museums, including the home of the aforementioned priest, where you can learn more about Mexico's colorful history. You can visit Dolores Hidalgo on a day trip from Queretaro, Guanajuato or San Miguel de Allende, but if you would like to stay, Casa Pozo del Rayo is a comfortable and accommodating centrally located boutique hotel. Read reviews and get rates for Casa Pozo del Rayo. The town of Loreto, on the east coast of Baja California Sur state, is framed on one side the imposing mountains of the Sierra de la Giganta, and on the other by the Sea of Cortez. Loreto has many natural attractions, including beautiful beaches, breathtaking cliffs, and impressive rock formations. Several islands just off the coast provide the opportunity for snorkeling and exploring. On a visit to this quiet town you will also have the opportunity to take a closer look at where the colonization of Baja California all began. It was here that the first Mission was founded, laying the groundwork for the establishment of the Church of Our Lady of Loreto. The town of Papantla is located in the northern part of Veracruz state, Walking through the streets of town you will find several interesting buildings and monuments. The Cathedral of the Lady of the Assumption is considered the oldest religious site of Papantla; its foundation is attributed to the first Franciscan missionaries who arrived in Mexico. Another striking building is the church of Cristo Rey, whose construction dates back to 1950 - it has a spectacular Gothic style architecture. Also worth visiting are the Municipal Palace and the Volador Monument, which pays homage to the ritual dance of the Voladores, as well as the mural "Tribute to the Totonac Culture." The archaeological site of El Tajín is very close to Papantla, and here you can experience the indigenous roots of the Veracruz culture characterized by the warmth and wisdom of the Totonac people. This is also the place where vanilla grows, so be sure to buy some to take home with you! Pátzcuaro is one of the oldest and most picturesque cities in the state of Michoacan. Its landscapes are framed by a large lake with small inhabited islands, most notably, Janitzio, which is well known for its Day of the Dead celebrations. Besides wandering the town's pedestrian streets, exploring its varied marketplaces and admiring the colonial architecture, there are several great options for day trips from San Cristobal de las Casas, including visiting several Maya indigenous villages and the nearby Sumidero Canyon as well as other beautiful natural attractions. Looking for a nice place to stay, Casa del Alma is a boutique hotel with modern architecture inspired by the town. Read reviews and get rates for Casa del Alma. Tequila is not just a drink. It's actually named after the town where it was originally made, Santiago de Tequila is located about 60 miles west of Guadalajara. Your visit to tequila country will not be complete without a stroll around this charming town, which has a fascinating history. Besides visiting some tequila distilleries, you can visit the church on the main square and wander the town's cobblestone streets.